I have just analyzed 93 Canadian tech startups that received capital funding, using the Mattermark database, from January 1st to Oct 15th 2013, excluding Biotech, Cleantech, Pharma, Oil & Gas, and Medical Devices. Aside from 4 seed deals where the amounts weren’t public yet, the total raised was $438 Million (including the HootSuite Series B $165 Million swing deal). Contrast that with $190 Million on 89 deals with 2012. Even if we back out the HootSuite’s numbers, 2013 funding has already eclipsed 2012 by $83 Million, and that will put Canada on a projected 35-40% growth rate, but the total numbers are still very small compared to the USA. Even with the HootSuite deal, Canada could finish the year with a projected $500 Million of investments, but that is only 3.3% of the total US equivalent investments of approximately $15 Billion per year. For comparison, just in September alone, $1.3 Billion were invested in the US across 207 deals (source: my private Mattermark analysis). But Canada’s GDP was 11% of the US in 2012 ($US 16.62 T vs. $US 1.82 T)! 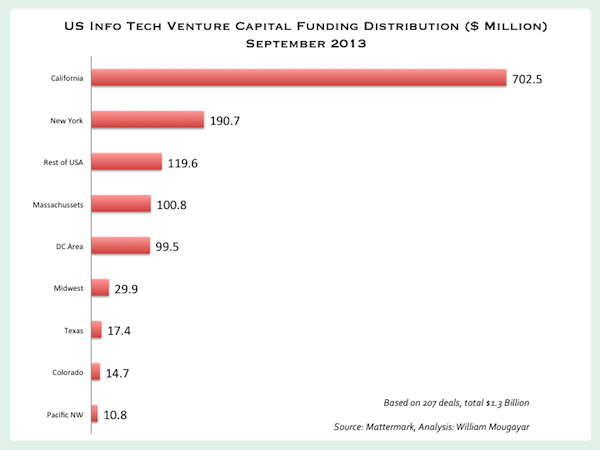 This means the Info Tech VC investments in Canada could be 4 times what they are today, i.e. $1.6 Billion, if we are to track the US levels. Let’s dive into this data. You may want to mentally back-out $165 M from the B segment, because it represented a single deal (HootSuite). 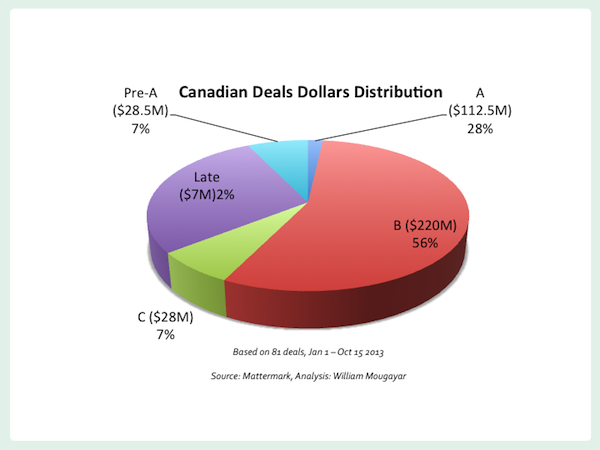 The Average Seed/Pre-A deal in Canada was $594K (based on 47 deals with data), the Average A deal was $5.4M, the Average B deal was $9.2 M. These are respectable ratios. Not surprisingly, Ontario has the largest number of deals and investment levels (excluding counting the HootSuite deal, which is in Vancouver), but BC is a good second overall, easily beating Quebec, even without the HootSuite deal. The Waterloo-Toronto-Ottawa corridor (if there is one), has always been a point of comparison. Here’s how these 3 pivotal regions stacked in the table below. It is noteworthy to see that Waterloo has garnered over half of Toronto’s investments, with only about a quarter of the number of deals. This shows that Waterloo has definitely emerged as a place with a steady and quality level of startups. Let’s focus on the deals that raised over $5 Million. The key revelation is that 11 out of the top 20 top deals were lead by US VC firms. It is not possible to extract exact amounts coming from US vs. Canadian firms, because the amount splits are never disclosed during rounds with multiple firms, but the US firms were quite well represented. We counted 31 distinct US VCs vs. 30 Canadian VCs that participated in the 89 deals. One could reasonably assume that the US VCs probably contributed to about half of the $438 Million. Still not enough Seed/pre-A investments. We need to fill the funnel with lots more, because that how it works. A smaller percentage of companies make it into the A, B, C rounds. Seed/pre-A is like the laboratories of startups. 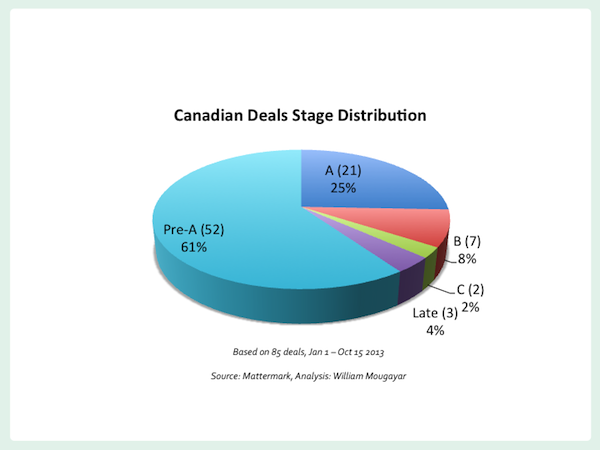 US VC firms are scooping Canadian deals, often in the A & B stages, when the de-risking is done. BDC Venture Capital, Real Ventures and iNovia emerge as the top Canadian VC firms taking risk with Canadian startups, with a combined total 20 pre-A/Seed investments, but they are followed by a handful of other firms. This is good for Canada, as you typically won’t see US firms there. Canadian VCs and Angels are still not aggressive enough in taking risks with the entrepreneurs. Lots of agony over seed level/angel-ready startups. The Canadian Accelerators haven’t produced runaway startups, yet. 2 startups went crowdfunding for their seed rounds: Blacksumac received $300K from Indiegogo, and Fabule raised $150K from Kickstarter. Waterloo is definitely on the map. It wasn’t 2 years ago. Montreal still doesn’t have any big deals in 2013. It’s an open field for US VCs. As much as the borders are transparent for Canadian companies that are doing well in the US, the same applies to US VCs who are coming to Canada.